The HDMI (High-Definition Multimedia Interface) cables that most of us now use to connect TVs and other devices in our living rooms, family rooms and home theaters were once a major step forward in the way we experience video and audio entertainment. HDMI made it possible to deliver perfect digital high-def picture and sound, as well as control signals, anti-piracy signals and even computer data, all on a single cable. HDMI cables became the replacement for analog cables connecting equipment produced during the first decade of the 21st century. The switch to uncompressed digital signal transmission was a huge step forward, and HDMI got better over time to keep up with quickly-improving video and audio standards. The original HDMI version 1.0 could support 1080p high-definition video and eight channels of 24-bit audio; today’s version 2.0 has full 4K video support at 60 frames per second, complete 3D video capability, support for the most advanced color spaces and the latest high-resolution audio standards with up to 32 audio channels available, an audio return channel, capabilities for an additional Ethernet connection on the same cable, and lots of other goodies. It’s just about everything you could need.The only problem with early versions of HDMI was that the required connector size made it impossible to use HDMI cables with smaller devices. The large connectors at each end were much too big to accommodate any ports which would fit on camcorders, cameras and other portable video units. The only problem with early versions of HDMI was that the required connector size made it impossible to use HDMI cables with smaller devices. The large connectors at each end were much too big to accommodate any ports which would fit on camcorders, cameras and other portable video units. 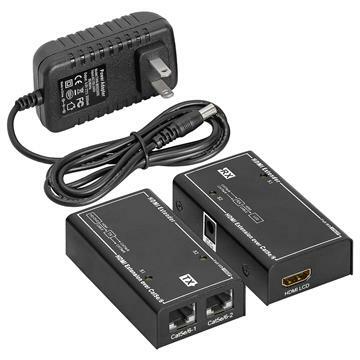 The solutions came thanks to updated standards released in 2006 and 2009; the 2006 HDMI version 1.3 included support for a "type C" HDMI mini-connector, and 2009’s HDMI version 1.4 added support for a "type D" HDMI micro-connector. Both HDMI mini and micro cables provide exactly the same signal quality and transmission capabilities as their original big brother, but the mini port and connector are 40% smaller than the large “type A” ones used for HDTVs and other large equipment, and the micro port and connector are 50% smaller. Camcorders and digital cameras started to appear on the market with mini HDMI ports shortly after the new standards were released, and cables were quickly made available for equipment featuring the new digital ports. The availability of mini HDMI finally allowed easy transfer and transmission of signals between common home and portable entertainment devices. The technology has now become an everyday part of our lives, with not only cameras but some projectors, cell phones and navigation devices also featuring mini HDMI ports along with a number of computer graphics or video cards. Most HDMI mini cables are equipped with a type C mini connector on one end and a “normal” type A HDMI connectors on the other, so the portable devices can easily be hooked up to an HDTV or monitor for full digital playback on a large screen. There are also mini-to-mini HDMI cables to connect two smaller digital devices. The story was a bit different when type D micro HDMI connectors and cables appeared on the market in 2009. Mini HDMI had been widely integrated into digital cameras and camcorders, and there weren’t yet many digital devices ready to accept the micro HDMI ports. Shortly after that, though, rapid advances made in smartphone technology and the huge popularity of tablets changed the picture in a hurry. The relatively-tiny type D port was tailor-made for the brand-new phones and tablets hitting the market, and micro HDMI quickly became standard on both devices. An inexpensive micro HDMI cable allowed anyone to display pictures and movies from their portable devices on their HDTV or monitor with ease. Not all devices are equipped with mini or micro HDMI connectors, so don’t automatically assume that you’ll be able to transfer digital signals from your phone or tablet to your high-def television. If it’s important to you that a device is able to send pictures or video via HDMI, be sure to check for an HDMI port before buying it. Thankfully, there’s no hocus-pocus necessary to determine whether you need a standard, mini or micro HDMI cable for a device. It should say right in the product manual or specifications which type of port is on the equipment. If you can’t find the manual, though, it’s still pretty easy; they’re all similarly-shaped and have 19 pins, but standard HDMI connectors and ports are about 0.55 inches wide and 0.18 inches high, mini connectors and ports are a little more than 0.4 inches wide and about 0.1 inches high, and micro connectors and ports are about 0.25 inches wide and 0.11 inches high. The internal wiring for the 19 pins is different for each type of connector – but that isn’t anything you need to be concerned with. Once you’ve figured out what type of HDMI cable you need, the rest is simple: find a properly-manufactured product that doesn’t cost an arm and a leg. Many companies charge an obscene amount of money for mini HDMI and micro HDMI cables, but what they don’t tell you is that all cables which meet or exceed HDMI standards are basically the same. There’s nothing extra a company can do to provide a superior digital signal; every cable that meets HDMI standards delivers the same performance. The design features you should look for, though, are gold-plated connectors on each end, molded strain relief construction, and a large gauge PVC outer jacket. The gold connectors ensure a quality connection and prevent corrosion over time, strain relief relieves pressure on the connector and wires, and a tough PVC jacket can protect against wear and tear. Our Cmple HDMI mini and micro cables include all three of these important features, which are integral to any high-quality HDMI cable. We know that patch cables are "mission critical" components of any Ethernet network – if they fail, the entire system can be useless. So we put the utmost care into the design and manufacture of our Category 5e patch cables. We also know that cables are definitely not “one size fits all,” because a 100-foot cable is going to be way too long for a simple router-to-computer connection, and a three-foot one isn’t going to help at all if you need a long cable to be run through a building. So we offer one of the largest selections of quality Cat5e patch cables on the market. These Cmple cables start with four twisted pairs of CCA (copper clad aluminum) stranded 568b conductors, designed for optimal data transfer at the high speeds required by today’s networks. They’re then wrapped in a sturdy PVC (polyvinyl chloride) jacket which will protect the conductors against the stress that comes with everyday use, yet still be flexible enough to endure the turns and twists required when cables are run into tight spaces. Molded strain relief is also a key feature of the Cat5e patch cables, so you can be certain that wires won’t break at the RJ56 connectors on either end. As we mentioned, our Category 5 cables are available in an enormous range of lengths: shorter 1 ½ three, five and seven patch cables, intermediate lengths of 10, 15, 25 and 50 feet, and long patch cables which are 75, 100 and a full 150 feet long. Available colors are black, blue, gray, green, purple, orange, pink, red, white and yellow. No matter which size or color you choose, you can be assured of the highest Cmple quality at the lowest prices imaginable. We guarantee that all of our Cat5e cables suitable for Ethernet applications meet or exceed all standards for data integrity and transfer speed, and are just as good as the ultra-expensive brands – without putting a big dent in your wallet. What is the best HDMI cable for Sony PS3 / PS4?